Blood From a Stone (2010). Photo by Sara Krulwich for the New York Times. One of the privileges of being the "paper of record," "arbiter of culture," etc. when it comes to New York theatre is getting the best news photographers on the scene. 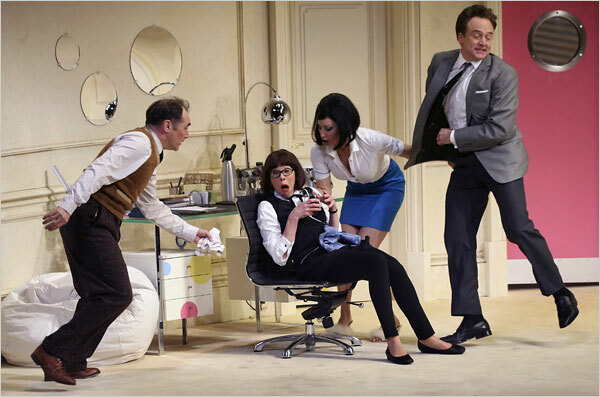 So I'm thankful for the New York Times' professionalism in this manner whenever they send out Sara Krulwich on assignment to photograph a play. Yes, so mighty is the Times that they send their own photographers (usually) to cover performances, rather than relying on whatever jpg your press rep flashed on his or phone at dress rehearsal. The reason, of course, is when you're the Times you take no chances about the quality of the "art" on your pages. And you can afford to. 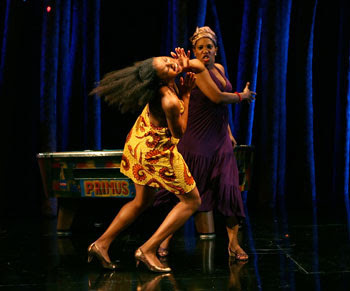 But the true beneficiary of Krulwich's work, I say, is for the theatre lover. Theatre photography is an often overlooked but vital participant in our theatre culture and in theatre history. Think--just think--of how much our perceptions of our theatrical past are shaped by particular production photos. And now think about how often those photos might have been from "photo calls" or other "posed" publicity shots and, thus, don't represent anything that happened on stage at all? Anyway, back to Sara Krulwich.Whenever I see a photo in the Times like the one above (which accompanied this month's review of the New Group play Blood from a Stone), one where the action of the play just pops out of the page and the actors come to life, I look down at the photo-credit and invariably it's a Krulwich. At first I assumed she was just another of the city's many pr photographers. But then I couldn't find her photos anywhere else. I'd find the "official" shots from the press kits and, apologies, but they just weren't the same. (Nothing wrong with them, certainly professional, just not works of art unto themselves.) After I started noticing this correlation between this name Krulwich and those kinds of photos, I started more actively looking for it in the paper--and saving pics, both from off the screen and using the old fashioned scissors. I now have my own private collection, but I hope one day she gets to publish her amazing documentation of the New York Theatre of the early 21st century. I have no idea how she works to get her unique effects. Whether she does a separate photo call or is actually allowed to shoot during performances (or, if not, in rehearsal?). But these photos never looked posed. Even when they're not as obviously eye-catching as the milk-in-the-face shot above (which is just showing off, by her standards) there's always genuine organic motion in them. In other words, pure action photography photojournalism. Sure enough it turns out her background at the Times originally was as photojournalist--including, not surprisingly, sports! In a brief personal essay she wrote for the paper's website last year, she tells of how her childhood love for theatre (and need to stay in the city more for her children) motivated her to demand the assignment from the paper. Indeed she practically made up the position! I set out to convince press agents and producers to allow me to shoot my own production pictures. And I definitely ran into resistance. Imagine asking someone who has spent millions of dollars on a show to give up control of the images that will run alongside reviews and news articles in The Times. It took time. 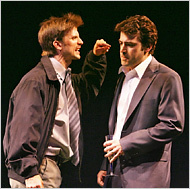 Off Broadway producers were a little more agreeable at first. Eventually, when it became clear that I was honestly documenting productions and not trying to embarrass or demean anyone, I was allowed into almost every play in New York, on or off Broadway. My feeling is: the picture in the paper should look pretty much like the performance you’re seeing and not some idealized version that’s simply meant to entice you to buy a ticket. So these stunning photos are quite an achievement of art over commerce. And as time passes, Krulwich's artistry will only enhance and merge with that of the plays themselves that she documents--since those lucky enough to have her visit will have their play preserved like no other. And what's more, it's a necessary service to the present. Sara Krulwich's photos make theatre look exciting. Even cool. We need that today in our major media outlets. Her Times "Lens" blog essay features a fantastic slideshow. But here are some of my own favorite Krulwiches from my personal collection that I've collected over the last few years. Boeing, Boeing (2008). A visual definition of farce. Reasons to be Pretty (2008) & In a Dark Dark Place (2007). As Krulwich captures, it was the actors' emotional liquidity that gave those productions whatever jolt they had. 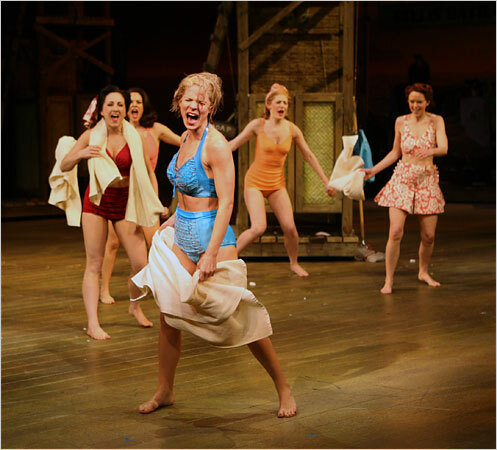 South Pacific (2008). The Cathartic Joy of Musical Theatre. Yes, good photography (and good theatre photography) is about more than "action shots" and motion. But to capture the feelings behind those human movements and put you on stage with them...that's great art. Let Sara Krulwich's work raise the bar for all who visually document performance--amateur or professional. Posterity is counting on us. Fantastic post! I had no idea. Thanks. Really nice to highlight the work of an excellent photographer! Just to add a bit: On shows I've worked on, Sara has usually come to a dress rehearsal and watched the whole thing and taken some shots, and then after the rehearsal, she has asked for some specific scenes to be replayed for her to shoot some more -- but without any phony freezing or anything like that. I should say, too, that there have sometimes been one or two other photographers from other publications there. And in the old glory days of the Village Voice, they NEVER used posed press-kit photos for theater reviews and features; they always sent a photographer for original shots. And while on the topic and also singing Krulwich's praises, I'll throw in a shout-out to Dona Ann McAdams who shot all the shows at PS122 (and other performance art venues) in the 90s, also capturing the dynamism and spirit of the shows. This was a fantastic post. Thank you so much for highlighting the work of someone in the theater community who doesn't get any attention - in fact, I don't think I'd ever noticed before that the Times' photos weren't the usual press packet photos used by everyone else. I'll definitely look out for Krulwich's work now. Wonderful post, much deserved. NY theater is lucky to have her. for position, I can appreciate all that Sara does for theater. It's not easy getting those emotional moments in a darkened theatre without a flash. Now that's talent.